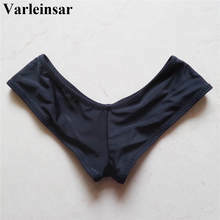 Please choose the size according to your waist and hip, get one size up if you are between sizes. Note:this size chart is specifically for this swimsuit, please check size chart for each swimsuit you are purchasing. Attention:due to the different places that fabric was cut,the real pattern of each bikini bottom would be a little diferent from each other. Please find the picture below to see the difference.